​Let Absolute Foundation Repair help you! ​Whether your commercial structure requires heavy-duty piles or a customized install schedule around business hours, Absolute Foundation Repair is experienced and ready to meet your job's requirements. Absolute Foundation Repair is your best source for commercial and residential foundation construction projects that are professionally finished and competitively priced. We specialize in both new construction and existing structures. ​Homeowners in need of foundation repair, a property owner seeing signs of foundation problems (cracked bricks, leaning chimneys, etc. ), or a real-estate agent needing a free no-obligation estimate, we are here to help you. ​​Contractors or property managers that are in need of commercial foundation repair or new-construction piles, contact us for more information. ​Absolute Foundation Repair is ready to serve all your foundation repairs and construction needs. Call us today at 919-590-9828 for a free estimate, or use the form at the right and we will get back to you quickly. Foundation Underpinning: Repair settled structures permanently from the foundation up. Basement Wall Stabilization: Repair bowed or broken walls permanently. Brick Pointing: Cosmetic brick repair and pointing. Slab Jacking: Raising settled concrete slabs, garage floors, slab on grade homes, driveways, concrete patios, etc. Waterproofing: Complete water management systems, exterior and interior waterproofing, interceptor ditches, French drain systems, etc. Engineered Repairs: Repairs based on engineer's specification or recommendations. Retaining Walls: Installation of retaining walls to prevent or stop erosion. Crawl Space Drainage: Install interior perimeter foundation drains in crawlspace to remove standing water and reduce moisture levels. Under Home Structural Repairs: Repairs to level or reduce bounce in floors such as sister joist, dropped girders, additional CMU piers, etc. ...then you may have foundation problems. What can cause your foundation to sink? The most obvious and (usually) definite sign of foundation problems is cracked bricks. Expansive soil swells when it gets wet and contracts when it gets dry. This constant expansion/contraction causes uneven movement of the home's foundation, usually resulting in cracking bricks on the exterior. Cracked bricks often have a zig-zag pattern, following the mortar joints. However, these cracks can run vertically, cracking the bricks themselves, horizontally, or any combination. It's most important, though, to realize this is a symptom, and not the problem! If you fix the cracking bricks by patching or filling, you're not addressing the problem, which will likely get worse. Money can be wasted by filling the cracks or even rebuilding portions of walls, just to have the problem reoccur. ​Your chimney is most likely the heaviest portion of your house. Chimneys are also usually attached to a support wall minimally with mortar or other braces that typically cannot hold the chimney in place when the footing beneath the chimney settles. This creates a potentially dangerous situation in which a heavy and (essentially) detachable portion of your home begins to shift. It's important to have chimneys looked at as soon as you see signs of shifting, leaning, or settling. Simply attempting to fill in gaps with mortar is masking the problem that will likely get worse. ​We specialize in the remedial repair of existing structures as well as end-bearing deep foundations for new construction applications. ​Foundation settling and shifting can be caused by building a structure on expanding or contracting soil, improperly compacted fill soils, or from poor or erroneous maintenance of the earth around the foundation. Whatever the cause of a settling foundation, this settlement can ruin a building's value and even render it unsafe. Absolute Foundation Repair, LLC, provides various solutions to solve foundation support issues including: helical pier and anchor systems, push pier systems, and wall anchoring products. 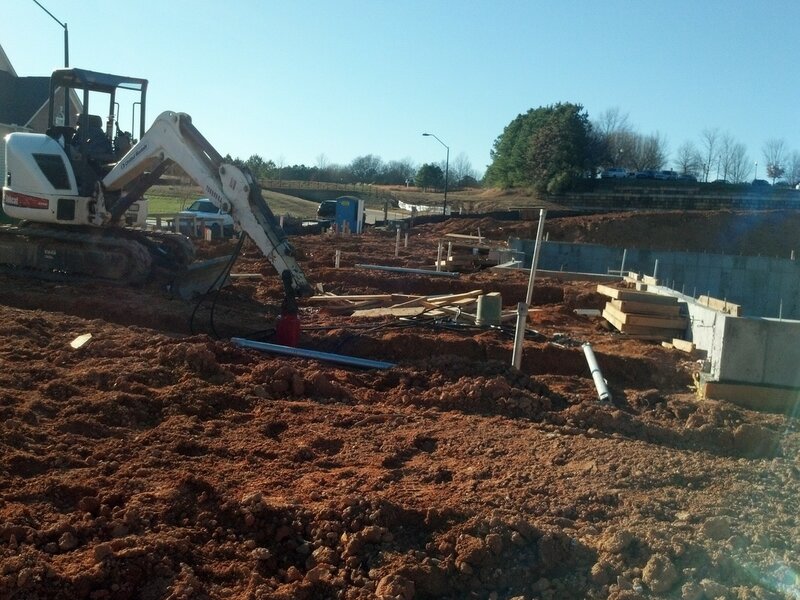 Whether you are in need of foundation repair, new construction or commercial applications, we will do the job right. Our referred engineers can assist you with preliminary project design, as well as provide the technical foundation repair information and support you can count on. © Copyright 2019 Absolute Foundation Repair, Inc. All Rights Reserved. Unauthorized use, copy, or duplication of any or all content from this site, other than for informative purposes, may result in legal prosecution. Any technical questions or comments regarding this web site should be directed by e-mail to: Support@AbsoluteFoundationRepair.com.